WINNIPEG - There were two winning tickets sold for Saturday night’s $5 million Lotto 649 jackpot, one from Calgary and the other in Regina. The jackpot for the next Lotto 649 draw on May 23rd will be approximately $5 million. 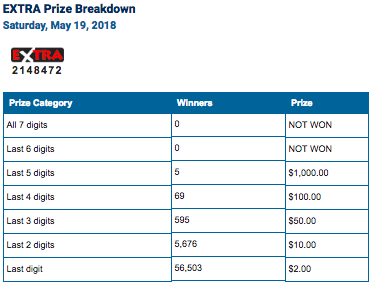 Here are the numbers from the May 19th, 2018 draw. 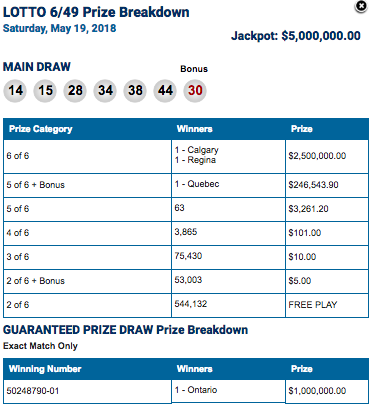 The Lotto Max draw for Friday, May 25th is an estimated $60 million dollars.